During the period July 10-15, 2007, I made my third trip to Germany and my fourth trip abroad since April 20, 2005. 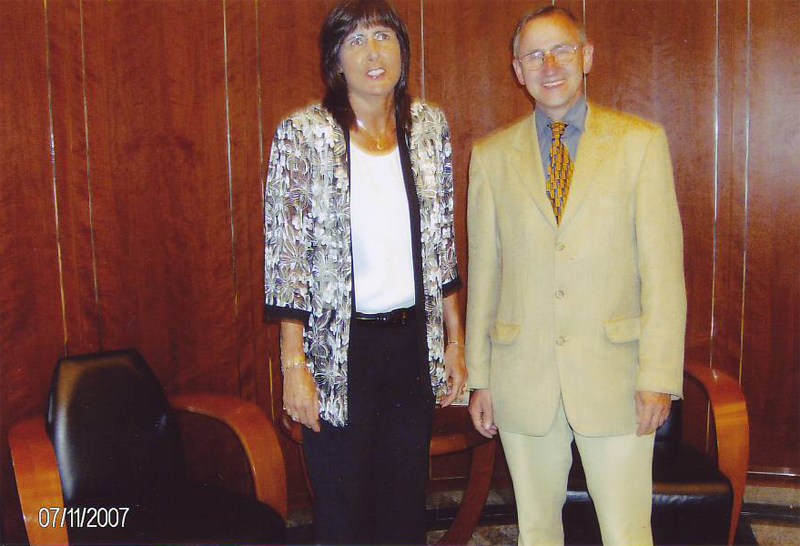 The fourth trip abroad was to Moscow, May 7-10, 2005. 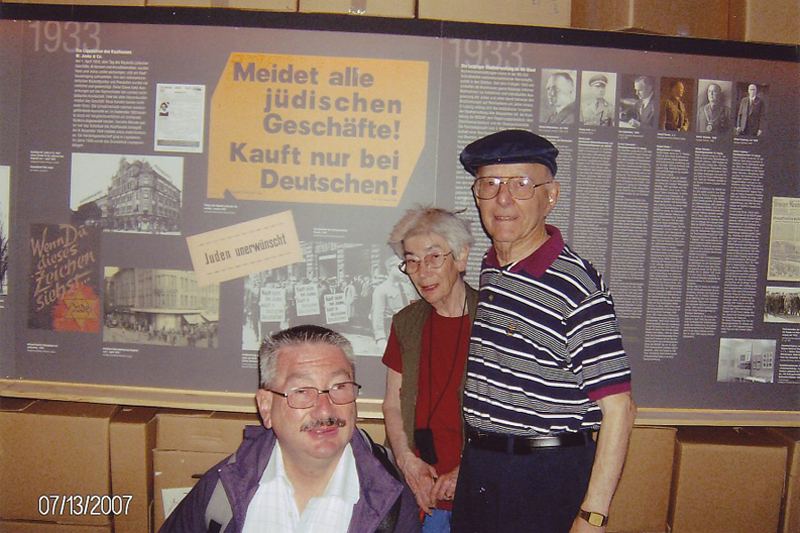 This trip was arranged for by Christoph Kaufmann, Photo Archivist, Leipzig, Germany City Museum, with the permission of Museum Director Volker Rodekamp. 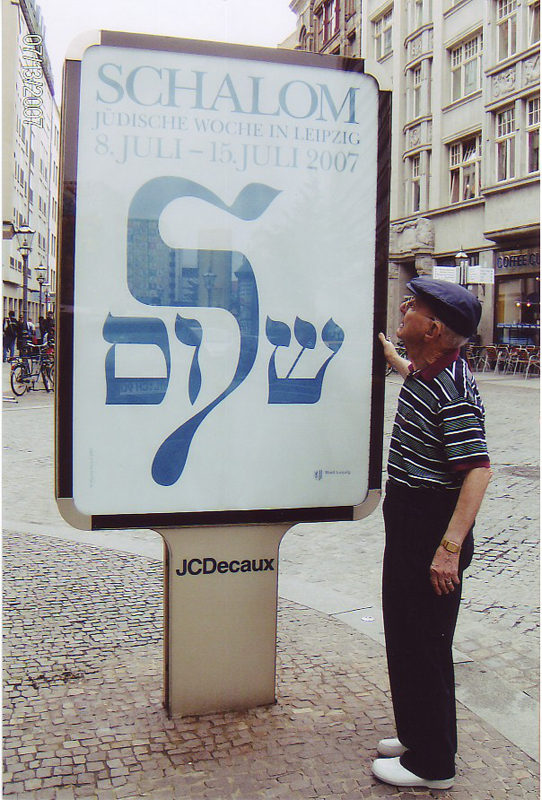 The purpose was to attend Leipzig Jewish Week, July 6-12, 2007. A few weeks before the finalizing of the trip, Anne began to have bronchitis attacks which we thought might prevent her from going. As a backup, we prepared our daughter Sherry Estep with a passport. Sure enough, the doctor said it would best Anne not fly such a long trip. The only flight schedule that could be arranged was to leave Atlanta,Tuesday, July 10, and return from Leipzig, Sunday, July 15. This would only allow attendance to the Jewish Week banquet July 11, and visit the Jewish Week exhibit at the City Museum. The remaining time could be spent as we saw fit. Chris scheduled what we would do after an exchange of messages. Chris met us at the Leipzig airport, Wednesday and rushed us to the Park Hotel located opposite the Leipzig railroad station captured by the 69th, April, 1945. The "Hauptbanhoff" is now a huge shopping mall as well as a railroad station. Later, accompanied by Chris, we went to the Jewish Week Banquet attended by approximately 75 people who were in Leipzig for Jewish Week. The banquet was held by the City of Leipzig Cultural Affairs Department, one of the trip sponsors. Three or four were mentioned and asked to stand for special reasons including me. 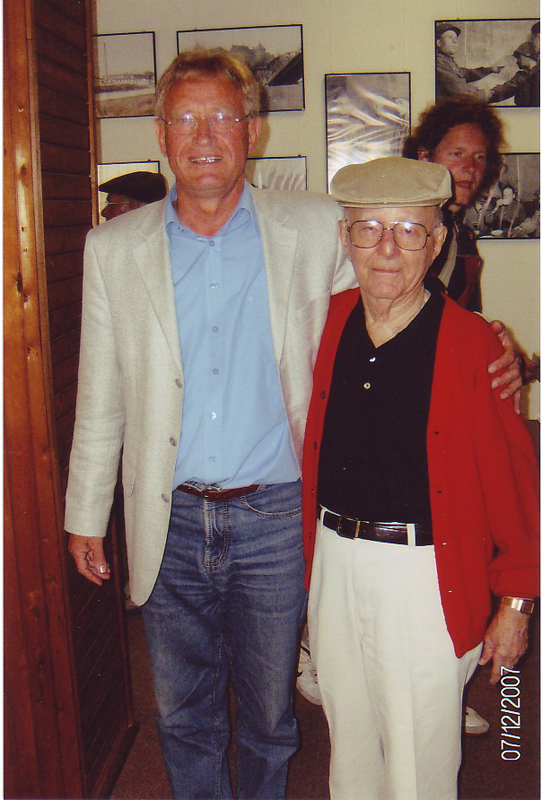 I was recognized as being one of the many Jewish soldiers members of the 69th Infantry Division in Leipzig, April 19, 1945, when the city was liberated. Thursday, a reporter and photographer from the Bild Newspapers, another trip sponsor, along with Chris, took us to Eilenburg and its Museum where we met Director Andreas Flegel and Mayor Hubertus Wacher. Most 69ers will remember that Eilenburg was almost destroyed by the 69th artillery. 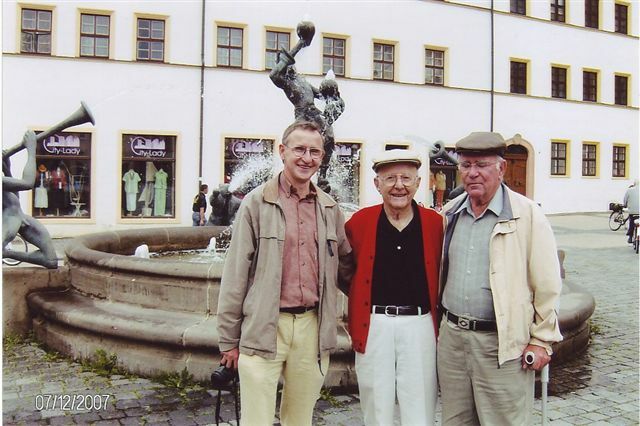 We then went to historic Torgau and met Heinz Richter who took us on a brief town tour. In historical writings, Torgau is first mentioned in the year 973. We visited the St. Mary's Church where Martin Luther' wife, Katharina Von Bora is buried. 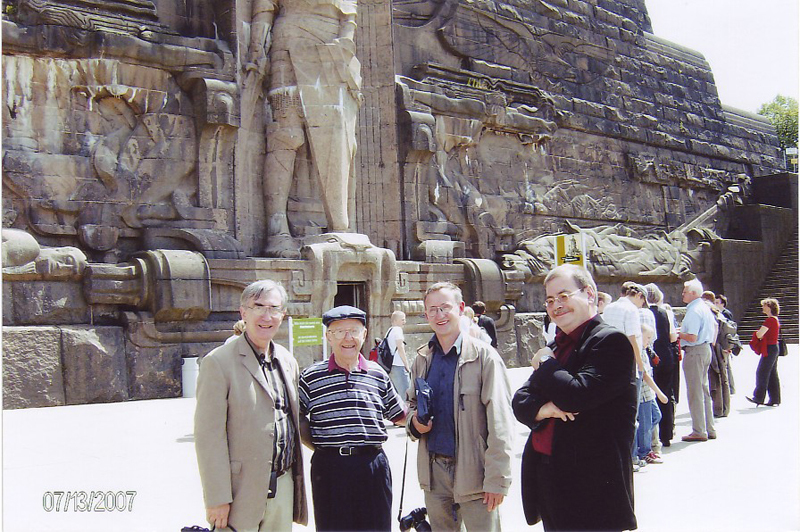 We saw Dr. Uwe Niedersen, historian of the April 25, 1945, American-Soviet linkups. We then went to the 69th's Torgau East Meets West Linkup Memorial on the banks of the Ebe River, and other places. Returning to Leipzig, about 4:30, Sherry and I were left to ourselves. We shopped at the Haupbanhoff Mall and walked around visiting interesting places near the hotel. 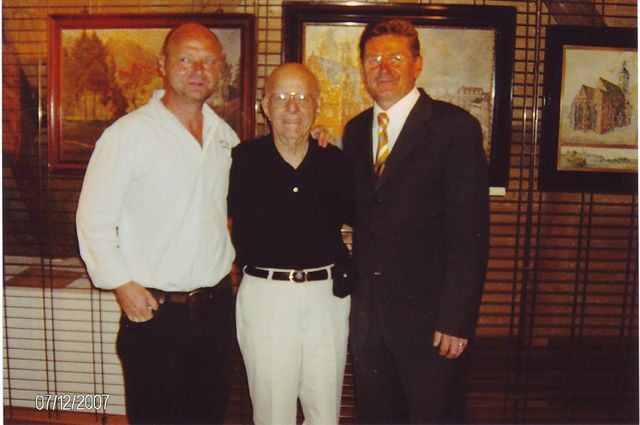 Friday, I was supposed to meet Mr. Raymond Heinz of Bell Flavors and Fragrances, another trip sponsor, but at the last minute a business matter canceled the meeting. Chris took us to visit the Leipzig Museum to see the Jewish Week exhibit, then to the Napoleon Monument where Director Steffen Poser took us on a tour of the monument while explaining its history. 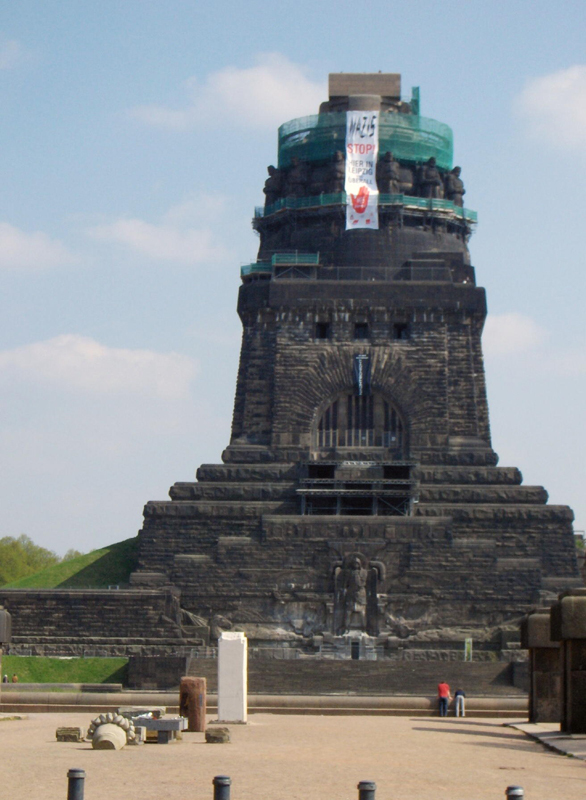 The monument, south of Leipzig, took 15 years to construct being completed in 1913, commemorating the 100th anniversary of the defeat of Napoleon in Leipzig. It is over 298 feet tall and is the tallest monument in Europe. It is also known as The War Of The Nations Monument. In 1945, it was used to defend against the attacking 69th Infantry Division and bears heavy artillery damage which is just now being repaired. In the evening we went to meet Chris' wife Christine, her mother and father, Chris' mother as well as son Thomas and daughter Anne. Thomas tended the barbecue cooker for a great outdoor meal. Doreen Beilke, the Bild newspaper reporter, was also there. Saturday, Sherry and I walked sight seeng for a while including visiting the St. Nickolai Lutheran Church built around 1165. 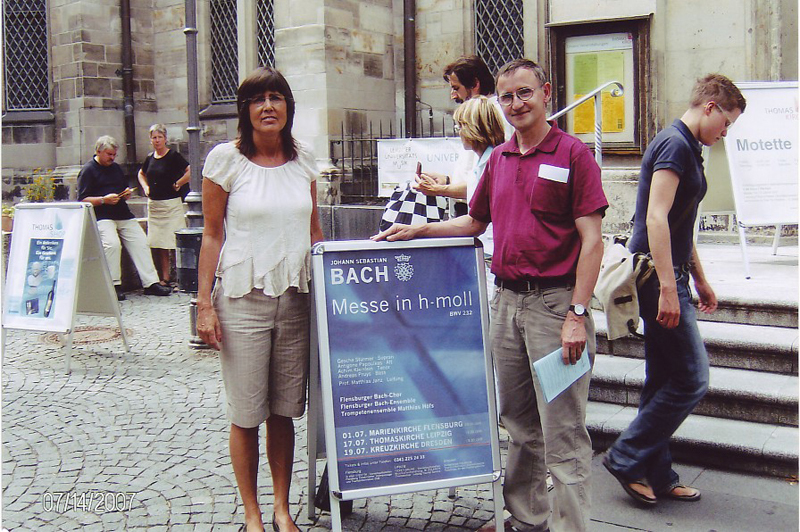 Chris met us at 2 o'clock to take us to a Johann Sebastian Bach choral and soloist concert in the world famous centuries old St. Thomas Church where Bach was choirmaster for years. Afterwards, more Leipzig sightseeing with Chris as guide. We departed early Sunday, July 15. To view photos, click on thumbnail photos below.